A growing rift between Finance Minister Ravi Karunanayake and the senior management of the Central Bank is surfacing now, worrying both financial markets and prospective foreign investors. The relationship between the Finance Minister and the Monetary Board of the Central Bank is not very clear under the new work allocation of the Government. In terms of this work allocation, the Central Bank, which should legitimately come under the Finance Minister, has been listed under the Minister of Economic Affairs of which the portfolio is being held by the Prime Minister himself. This was an unworkable work allocation and this writer pointed it out immediately after the relevant Gazette was issued by the government in January 2015 in a previous article in this series. The only hope about this bizarre work allocation at that time was it would help the Government to reform the Central Bank if it is placed directly under the Prime Minister. This was promised by the Prime Minister when he delivered the first economic policy statement in November 2015. However, the subsequent events proved that the much needed reforms did not take place with regard to the Central Bank or the financial sector at large. Instead, the financial markets and the good governance activists were startled by a bond scam within the Central Bank about which the Government did not take any effective action in terms of its mandate to establish a clean society in the country. Its ripples are still rising ominously in ever increasing intensity worrying the government and shaking it to its foundation because, contrary to the Government’s expectation that it would die out soon, the civil society activists have not stopped pestering it for justice. Against this backdrop, the Finance Minister, obviously worried about the truncation of his powers, has attempted to grab them informally by interfering in the work of the Central Bank. There was a report that the Finance Minister had walked into a meeting of the primary dealers in the Central Bank unannounced voicing his dissatisfaction openly about the bank’s performance. This was unprecedented because none of his predecessors had resorted to that kind of tactic and it certainly would have frightened the Central Bank officers as well as the primary dealers present at the meeting. Then, there was an attempt at grabbing the legitimate functions of the Monetary Board such as fixing the value at which the banks should lend to vehicle buyers. In Budget 2017, there were a large number of budget proposals which would have been attended to by the Monetary Board under the powers vested with it by law. As this writer had pointed out, it had diminished the value of the Budget which had taken some positive measures to reform the country’s ailing fiscal sector. Then, it became a vocal battle in which Finance Minister Karunanayake is reported to have criticised the Governor of the Central Bank and its senior officers in public. Apparently dismayed by Governor Indrajit Coomaraswamy’s open and frank assessment of the state of the economy in the address he delivered when launching the Central Bank’s Road Map for 2017 and Beyond in early January 2017, it was reported that the Minister had equated the Governor to a hospital attendant who had helped the previous administration to send the economy, the chronic and acute patient, to the intensive care unit or ICU of the hospital. The Minister is reported to have said that it was he who had taken the patient out of ICU. The Governor’s right to speak the truth and how it would help the government to build a sound economy were analysed by this writer in a previous article in this series. Though the Minister had pacified the Governor later calling him a “good soul”, he had at the same time castigated two or three senior officers of the Bank for conspiring to depreciate the value of the rupee in the international markets, a move to embarrass the government, in his opinion. He had even threatened to reveal the names of these officers in the days to come. Minister Karunanayake had, according to the report, vowed to stabilise the exchange rate which is now under pressure for depreciation within two months. If he fails, it implies that it is due to the sabotage of his work by the two or three unnamed saboteurs in the Central Bank. This is a battle between politicians and professionals which is not totally unexpected. The architect of the Central Bank, John Exter, too predicted a situation in which the central bank management and the politicians might be embattled in conflicts which is not savoury for the smooth functioning of the economy. He had noted, in the report he submitted to the Government on the establishment of a central bank in the country, known as the Exter Report, that such conflicts would be more intensive in times of economic crises than in times of economic stability. Thus, the current situation has provided a fertile ground for the battles to be intensified. Hence, he had proposed in the Exter Report that there should be “continuous and constructive cooperation between the Monetary Board and the Government” (p 12). The Secretary to the Ministry of Finance, who is a member of the Monetary Board, is to act as the conduit for such cooperation by making the views of the Minister or the government known to the Monetary Board. However, the final outcome of such cooperation will depend on the maturity and experience of the men occupying the key positions in the Central Bank and the Ministry of Finance. It is something to be attained through “experience and the slow growth of political conventions” (p 13). These noble expectations of John Exter have not materialised in Sri Lanka even after 67 years of political independence. Instead of extending cooperation, there have been attempts by politicians at steamrolling the Central Bank at various times. In 1959, the Government of the late Wijayananda Dahanayake issued a directive to the Monetary Board to reduce interest in an attempt to win the forthcoming elections, but it was voted out of power soon after. In 1976, the then Minister of Finance, the Late Felix R Dias Bandaranaike, angered by a frank report filed by the then Director of Economic Research, the late H.N.S. Karunatillake, that the nationalisation of the plantation industry was marred with a number of deficiencies, prevailed upon the Monetary Board to transfer the latter out of the Economic Research Department. This was corrected only after the fall of that government in 1977. Then, in 2004 when this writer was the Deputy Governor of the Bank, he was accused by Mangala Samaraweera, then a powerful Minister of the Government, and Parliamentarian Wimal Weerawansa that this writer was conspiring with the opposition to depreciate the exchange rate. This charge was made in the media, live television discussions and press conferences. It was left to Governor Sunil Mendis to invite Parliamentarian Wimal Weerawansa to the bank and give a basic lecture, similar to the basic economics course known as 101 Economics in the parlance of universities, as to how the exchange rate of a country is determined. To his credit, Parliamentarian Weerawansa never made that accusation again. What is happening today is a repeat exercise of that episode with different actors playing key roles. What is incomprehensible is that a seasoned politician like Minister Ravi Karunanayake, who has fought vigorously for establishing a “responsible government” in the country, resorting to hurling accusations at unnamed central bank officers when economic truth has been something else. Can exchange rate be fixed by politicians or central bank officers? Can two or three officers of the bank acting in conspiracy cause the rupee to depreciate in the market? Anyone who has no knowledge of even the basic market practices might think so. However, markets are different and they cannot be manipulated by a few officers in the bank or in any other institution in the country for long. By the same token, even a Minister of Finance cannot stabilise the value of the rupee if it is on a continuous downward move. The truth of this fact would have been obvious to Minister Ravi Karunanayake, who is reported to have vowed in late June 2015 that the rupee would be stabilised at around Rs 129 per dollar in two weeks. Instead of Rs. 129, it ended up at Rs. 144 per dollar by the end of 2015 and Rs. 151 by the end of 2016. How is the exchange rate of a country determined? This could be illustrated by a simple example as follows. An exchange rate is a price and here the price is the expression of the value of one currency in term of another currency. For instance, the price of the US Dollar in terms of Sri Lanka Rupee is that one Dollar is equal to Rs. 151. At this price, for any Sri Lankan to buy a Dollar, he should spend Rs. 151. Conversely, for any foreigner to buy a Rupee, he should bring less than one US cent. The popular fallacy is that the government can fix this rate at any level it wishes. For instance, the fallacy says that, if the government wishes, it can fix the rate of the Dollar at Rs. 100 or even below. Can this be done? The answer is both yes and no. ‘Yes’ if the domestic purchasing power of the Rupee has improved against the Dollar so that anyone who has acquired a Rupee has the same purchasing power as a holder of a Dollar at the new rate. This was presented by the Swedish economist Gustav Cassel nearly a year ago in a celebrated theory known as the ‘Purchasing Power Parity’. What he said was that when there are two different price levels in two different countries, the exchange rate moves appropriately to make the purchasing power of the two currencies equal to each other, or in other words, to make operation of the purchasing power parity. ‘No’ if the true purchasing power parity is not what the government has mandated its currency to have as its international value. This could be understood by examining the following simple example. What is a Rupee to a foreigner? It is an entitlement to buy a basket of goods and services from Sri Lanka’s economy worth Rs. 1. That is determined by the domestic price levels. Similarly, a Dollar to a Sri Lankan is the entitlement to buy a Dollar’s worth of goods and services from the US economy. Therefore, when a country announces its exchange rate, it tells the rest of the world that ‘come and buy a Rupee’s worth of goods and services from our country by exchanging your currency for ours’. Hence, when the exchange rate is fixed at an appreciated value, it tells the rest of the world that they should bring more foreign currencies to buy those goods and services. It is a way of raising the value of domestic goods and services to foreigners. Suppose for example that a potato seller at Delkanda Pola announces that his potatoes are sold for Rs. 10,000 per kilo. Can he sell his potatoes at that price? Yes if the potatoes are sold for the same price in other Polas as well. But if potatoes are sold for Rs. 100 per kilo at Nugegoda and the transport cost and other inconveniences to travel to Nugegoda are simply Rs. 10, a buyer would move to Nugegoda and buy his potatoes. The Delkanda Pola potato seller is therefore forced to bring down his price to a level of Rs. 110 per kilo to make his potatoes as equally attractive as those at Nugegoda. This is ‘purchasing power parity’ and according to it, price differences could occur in two different markets only to the extent of the existence of transportation costs and other inconveniences commonly known as transaction costs. Let’s now apply this analogy to the exchange rate. Suppose that the government announces to the rest of the world that the value of Rupee is on par with the Dollar, that is, anyone wishing to get a Rupee should bring a Dollar with him. Suppose further that the domestic price of tea is Rs 500 per kilo. Then, for an American to buy a kilo of tea, he should bring $ 500. This is like the Delkanda Pola potato seller announcing that his potatoes are priced at Rs. 10,000 a kilo. Will the American buy tea from Sri Lanka? Yes, if tea prices in all other places are $ 500 a kilo. But since the American can buy a kilo of tea for $ 4.50 from neighbouring India, for him to buy tea at $ 500 a kilo from Sri Lanka, he should be an extremely stupid person. So, to make Sri Lanka tea as attractive as Indian tea and induce foreigners to buy Sri Lankan tea, the exchange rate should be depreciated to Rs 111 a Dollar. This is sad and frustrating, but unavoidable as long as domestic tea prices remain at Rs 500 a kilo. Since a country produces a variety of goods and services, it is not a single price like tea that would apply, but the general price level that represents the prices of all the goods and services. This is measured by consumer price indices and their increase over a long period is known as ‘domestic inflation’. Hence, for a government to maintain an appreciated exchange rate, it should necessarily keep its inflation lower than that of other competitive countries. If the domestic inflation is at a higher level, as is the present case in Sri Lanka where inflation runs on average at 4% per annum according to the latest data but has been on average at around 9% per annum over the past decade, any artificial appreciation of the exchange rate through other means will not be sustainable. This was the truth that was pronounced by Governor Indrajit Coomaraswamy in his address at the launch of the bank’s Road Map for 2017. It is a truth which Minister Ravi Karunanayake has failed to accept. As long as this rift proliferates, it boomerangs on the good governance government led by both President Maithripala Sirisena and Prime Minister Ranil Wickeremesinghe. Hence, it is advisable that it be settled early. Another excellent piece by the redoubtable Dr. Wijewardene. It all boils down to the damage done by the Rajapaksa gang which emasculated or ,plainly speaking castrated the traditionally independent role of the Central Bank Governor by 1) appointing an absolute square peg in a round hole Nivard Cabraal as Governor.2) Politicisisng every layer of authority in the Central Bank.3) Presenting a terribly distorted ,though rosy, picture of the economy in the form of the Annual Report, which, used to previously regarded by economists and lay persons alike as an absolutely true indicator of the national economy. So it is unsurprising that the current Finance Minister is very uncomfortable with what the much respected and able Governor Coomaraswamy is trying to do in reforming the role of the CB and make it perform in the way it should,Once an institution and its traditions are destroyed it is next to impossible to go back the days of old.Each succeeding batch of politicians are very comfortable in letting things remain as they are or further increasing their cancerous hold on the leavers of power.CB officials too are now comfortable by gaining perks and promotions by kow towing to their political masters.Who cares about competence when there is an easier path of survival? A little light appears in the tunnel though.As long as publications like the Colombo Telegraph provide the space for highly knowledgeable people like Dr.Wijewardene to air their views on critical issues facing the country , public awareness is generated.Such awareness shrinks the space of the politician to act with impunity.It is like holding a powerful torchlight on a thief !! Where were all these great thinkers during the yhears 2005 – 2015? People say Prime minister took the central bank underhim because UNP did not have money. So, he used the Central bank scam to make UNP rich. Now, UNP has a rich businessman who will donate enough to do the election. That is besides, politician businessman who became a minister. Looks like Karunanayake is living up to his unsavory reputation of being a ‘fixer’ and ‘conman’. The present Governor of the CB is well known to be beyond corruption and has a reputation of being straight and forthright and will not pander to the whims and fancies of politicians. This is obviously a problem for crooked politicians who will try to screw the country through scams and devious ploys for their selfish purposes. Unfortunately, the PM is up to his armpits in the Bond Scam, so little can be done to rein in Karunanayake with his devious plans to control the CB. 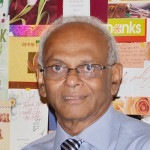 DR.Wijewardena should be commended for trying to explain in simple terms a subject which is complex in nature.Any person who has never studied Economics or related subject (perhaps with the exception of Politicians) and in possession of an average IQ should be able to understand how the Exchange Rate works. I thought the Finance Minister was supposed to be a “qualified” Accountant and would surely have come across the subject during his Student days unless of course his Qualifications are of Honorary Nature !!! Whatever the repercussions as finance minister Mahinda Rajapakse proved that the exchange rate could be fixed by the politicians when he announced a 3% devaluation of the Rupee while presenting the budget sometime back.The Governor came to know only while listening to the budget speech. I believe Dr.Wijewardene’s article should translate in to Sinhalese and Tamil languages and publish in mass media. He had explain how the exchange rate works in a country in very simple manner. This will help to safeguard reputation of our honest professionals from coward politicians. Not “Steamrolling”, this time it is “Nuclear Bombing”. It is already reported that Mr. Arjun Mahendran is functioning as an “Advisor” to the Ministry of Finance. He has already attended two meetings along with the Secretary to the Ministry of Finance, Mr. Paskaralingam (another Advisor) and the Governor of the Central Bank. At one of those meetings held on January 6th of this year, he (Arjun Mahendran) is reported to have given “Guide Lines” to be followed by the Monetary Board. Already some protests have been made many more are in the offing; but this “Nuclear Bomb” (Arjun) will continue regardless. What a state of affairs? It is simply politicians wrecking Sri lanka to live their dreams. MAhinda Rajapakse stole from the govt. So, did Ranil Rajapakse. Now, they can confront each other. Didn’t Galleon Ravi Karunanayaka call the CB Boss Dr Samy a Hospital Attendant?. Our Yahapalana Srilankawa must be the only place where these humble orderlies can hold such important and prestige Government positions. A fine essay by Dr.Wijewardena in simple language.Frankly,I would like to learn Economics from him. After reading this piece,it is clear that Minister Ravi Karunanayake wants to usurp the functions of The Governor Central Bank! If this happens the economy will be in a spin…. Read the following. How do Maithripala Sirisena Keep silent when below is the situation. It looks Simply Ranil followed what Mahinda Rajapakse did. How could Perpetual Treasuries Ltd., the non-bank primary dealer of the son-in-law of former Governor of Central Bank Arjun Mahendran earn a profit of Rs.13,000 million in 21 months. The former Governor’s conduct in the fraudulent bond transaction had been deceiving and the Prime Minister who had instructed him in the transaction too is responsible for the scam. Politicians keep your dirty hands off central Bank! JR started humiliating government officials by stoning the houses of Judges. Chandrika introduced political appointees to central bank when there are highly qualified people there. Now this lot is playing havoc! Some times foreigners ask us if it would have been better if the British were still ruling us! Dr. W.A. Wijewardena is a truly patriotic ex-public servant with the good of the country at heart. The country is fortunate we have such men among us – although the breed is becoming fastly extinct. He speaks loud and clear in matters concerning Finance, which is his forte, and educates the public on the intricacies of the complex discipline. One hopes our political “leaders” take the trouble to read and learn from what he writes. That sadly will exclude the larger number of MP’s in the Legislature, to whom – considering their educational and IQ levels – what Dr. WAW writes will be Double-Dutch. That the Central Bank Report is no longer reliable has been established since the days of Kabaralal, yes-man and crook – and, perhaps even before. This is not surprising because Sri Lanka has now entered the Law of the Jungle. Whatever hanky panky Rajapakse or Sirisena does they cannot control the actual value of the Rupee – determined by hard inescapable realities. Ravi K must accept the fact he is nothing more than a Junior Accountant otherwise unsung in professional circles though wearing a hat far too big for his swollen head. As the Sunday Times wrote years ago he hardly conceals his ambition of becoming President – someday. God forbid. Dr. WAW and Colombo Telegraph deserve the public’s thanks to keep truant politicians and officials under check.